According to Alexa the Pinterest website is already ranked in the Top 25 in South Africa. I have seen no mention by any agency that their clients are actively engaging with the Pinterest community as yet. I am not just talking about simply creating an account and pinning a few things to a few boards, anyone can do that. I am talking about utilizing Pinterest for crowdsourcing of some type to achieve a business objective. If you know of any Pinterst campaigns originating from South Africa please let us know by commenting below or getting in touch via the various social media channels. 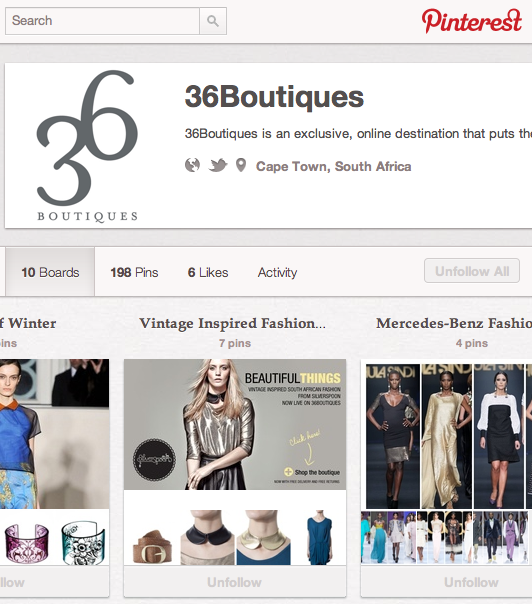 36Boutiques is South Africa’s premier online fashion store for Women. They are currently running a simple little contest on Pinterest where their followers are able to win a pair of Melissa wedges. Follow 36Boutique on Pinterest. Find the pair of shoes, repin & you could win. Easy does it.